The iPrice Group conducted a focused study in the Southeast Asian markets to determine if the startup founders’ fields of study and level of education influence their success. 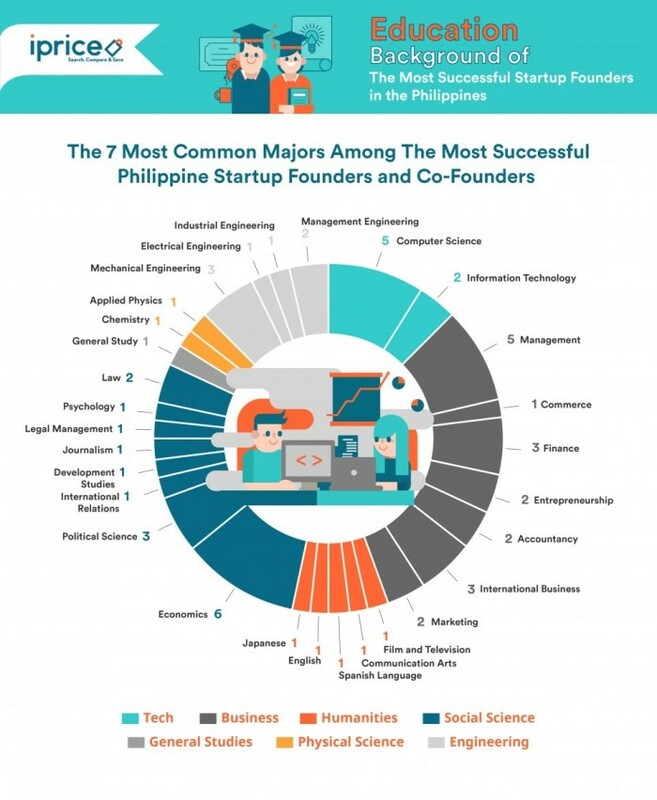 In the Philippine startup scene, the results suggest that business and social sciences are the two most common fields of study among Philippine startup founders and co-founders. Interestingly, more founders and co-founders took their bachelor’s degree in the so-called “Big 4” Philippine universities and later pursued higher studies abroad. After examining all 54 startup founders and co-founders’ educational background, they show a marked pattern for attending top-tier universities. Meanwhile, out of the 31 startup companies on the list, only seven made a successful exit: OLX.ph, Chikka, Airborne Access, Netbooster, Xurpas, I-remit, and Morphlabs. The so-called “Big 4” universities of the Philippines — Ateneo De Manila University, De La Salle University (DLSU), University of Santo Tomas (UST) and University of the Philippines (UP) — dominated the top six list with a total of 32 founders and co-founders. Ateneo leads at 12 founders and co-founders. Storm Technologies, Wolfpac Mobile, and I-Remit have two Atenean founders and co-founders each, namely Peter Cauton and Paulo De La Fuente of Storm Tech; Myla Villanueva and Ray Espinosa of Wolfpac Mobile; Bansan Choa and Ben Tiu of I-remit. Ateneo’s most notable founder is Nix Nolledo of Xurpas. DLSU has nine founders; Raymond Racaza is the only founder in the list with two companies, Xurpas and Xeleb Technologies. Airborne Access’ Jay Fajardo is also one of DLSU’s notable alumni alongside with Wilson Damarillo of Morphlabs and Bansan Choa of I-remit. In third place, UST has six founders and co-founders, its most prominent being Alexandra Roxas of Chikka Asia. UP is in 4th place with four founders and co-founders. OLX.ph’s RJ David and Airborne Access’s Tony Abello are its most prominent alumni. As far as the international education of startup founders is concerned, most in the top list are dominated by American universities Level Up! founders and co-founders Ben Colayco, Phil Cahiwat, and Syam Devineni are all from New York University; the latter’s most prominent co-founder on the list is Yoram Heller of Morphlabs. Harvard Univesity’s most prominent founder on the list is Dennis Mendiola of Chikka Asia. Other international universities attended by Filipino startup founders and cofounders are the University of Southern California, the London School of Economics, Columbia University, and Santa Clara University. The analysis of startup founders and co-founders shows that, as far as their Bachelor’s Degrees are concerned, Business dominated with 32%, followed by Social Sciences with 28%. Tied for third place are tech and engineering with 12.5% each. Only three founders in the financial industry have computer science background; Ron Hose, Coins.ph, (Cornell University- MS Computer Science); Runar Petursson, Coins.ph (University of West Florida- B.S. Computer Science); and Robertson Chiang, Dragon Pay (Ateneo – B.S. Computer Science). Most startup founders and co-founders in the Philippines attended top-tier universities locally and internationally. The “Big 4” universities are their most common choice when it comes to studying for a bachelor’s degree. The popular belief that most startup founders and co-founders have computer science and information technology background is not true for the Philippine market. Only 12.5 percent studied computer science and information technology combined. Each pilot could lose perks worth up to HK$1.2 million annually. .. Your weekly update on job movements in HR - featuring changes from Bupa, Cyberport, the labour department and many more. ..
Could the way you speak be hurting your career? A common type of speech known as “vocal fry” can hurt a job candidate’s prospects, especially if you are a woman. ..